This page last modified 2019-01-11 08:59:13. Respawn time is from 26 minutes to 32 minutes. May the trees offer you shelter and food. I kill him and this camp on my 51 sk. My sk is pretty twinked though. has 5k hp, with 1200 ac at the time, with just a V. Also blew DS pots and Cel heal pots (Although i think i could have done it without the heal pots) the whole time taking the camp. The mob is really resistant, but if you can clear the camp, then you can take the mob easy. Lower hp than the lava duct's, only downside is is stun, which seems to be a good 6 - 8 second stun, so come with high resists. I will also confirm he is the one who spawns under the ramp heading to the fire giants. Seems like a 50% pop rate, at least it has been so far for me, 1 lava, then 1 stone, and so on.... Dropped the druid chest piece, heading to try again today. The Stone Spider is not by the Fire Giants ramp, it's under the small ramp in the spider room, ie. the room with all the spider webs and the big orange spider on the wall. Look for web with a soldier stuck in it, with only his helmet not covered with spider webbing, and thats the room with the ramp. The stone spider is in fact in the room with the ramp which leads to the fire giants. His PH is the the spider under the ramp going up to the Fire Giants and Naggy. That's the location of zone in. Boxed him with 51 shd and 57 cleric. Easy as pie. Watch the adds. Spawns right under the ramp. I'd say 1 in 4 spawns is the spider. Both times it popped for me, it had the orb and one stone silk. Soloabe for lv 58 BL? My 60 monk and 53 bst friends soloed him ez. From what ive heard, most likely warrior + druid could do this, but b/c of its high resists, could be tough for druid to solo. Hit monk for 70 tops. We got to the room and killed the initial LDC that were there and set a timer. 20-22 min passed and the Stone Spider popped... that time passed again and LDC spawned... same time passes and second Stone Spider popped. #Anonymous, Posted: Apr 16 2002 at 11:17 PM, Rating: Sub-Default, (Expand Post) Heheheheheh...I'm ecstatic! I was soloing with my 12 druid in Oasis, died, and on the CR someone auctioned a BCP in EC. I asked price, he said 250. I said i had 150. He said ok, but then i told him it was on my alt. SO HE JUST GAVE IT TO ME.) I'm psyched, a cool piece. Ok, i was level48 at the time, got some guildies with me to camp this moe foe for the orb. After about an hour and a half, things went bad and the necro dies. Monk dies trying to drag corpse to cleric for a res. The rest of us zone out. I log on my cleric to res the two fallen guildies and ended up ressing about 8 others at the zone (that's solB for ya <wink>). Anyways, i found out that someone already took the ss camp. I couldn't group with him even tho i told him i just wanted the stoopid orb. I was about to log for the night, the guy shouts, "Orb!" and he delivered it to me at lava zone line. Wow. Side Note: I got the prickly pear (Lore only) on a Vox raid, and punked out the Noble in Lguk cause he was standing there on the way to the king and dropped the necklace ). Hardest part for me was getting to level 50. I spent a total camp time of an hour and a half for all components. i just bought one for my dru on the toxe palles server for 250pp! #Anonymous, Posted: Feb 14 2002 at 12:17 PM, Rating: Sub-Default, (Expand Post) I am a lvl 52 sk on the Tribunal server. The orb is the last item I need for my Life Leech quest, but both times I have killed Stone Spider he has dropped the BCP. If anyone has a Crystaline Orb on the Tribunal, please send a tell to Oscuro, Cantar, or any member of the Evermoon Guard and I will buy it off you. 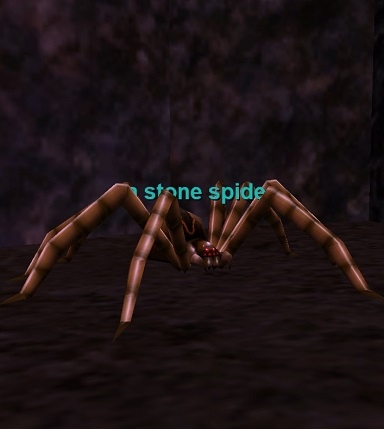 I Camped the Stone spider with a lvl 58 Paladin, (im a lvl 50 SK hehe) When the Stone Spider finally popped(after a Dreadful 2 hours of PHs) We beat him up(at the risk of almost dieing from the mad Poison) hes not that magic Resistant we Rooted him and snared him easy, JUST Dont leach him if you got a paladin Rooting, it will break it(dont know why Guess Verant just thought they'd be special), anyway we camped him 2 hours for the orb and guess what? he dropped the Dang BCP!, so If your an SK and camp this guy, Please be sure to wear your lucky rabbit's foot, AND Bring a Cleric/Paladin!, ooooo and a Rogue is good these guys have major HP. #Anonymous, Posted: Jun 29 2001 at 6:40 PM, Rating: Sub-Default, (Expand Post) drOOds, what's up drOOds, serve your people, your masters and TP whenever we need 1 or else!!! #Anonymous, Posted: Feb 22 2001 at 9:27 PM, Rating: Sub-Default, (Expand Post) I had just dinged lvl 5 with my halfling druid(on Ayonae Ro) and went to practice forage and buy what spells I could afford when Raini a great and beautiful druid sent me a tell and when she found me she gave me the BCP. I was stunned it is awesome for a little guy like me. Thanks again Raini. Once upon a time this was worth around 2kpp...now its worth much less since the new Elder, Withered and other new druid armor is out. Only good thing about this tunic is that it has great AC and AGI, which is best for the Druid who likes to hunt in dungeons...plus it has a brown steel look. I read on Eq Druids that added new Brown Chitin Leggings for druids. Anyone know who drops these? You might be thinking of Black Chitin Leggings which appear as Blackened Iron armor when worn. It sounds somewhat the same.